Hell has various levels and degrees of torment. In some of them, the torment and horror is greater than the others. 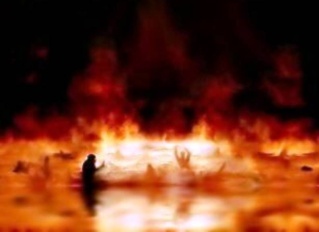 The people who are to be doomed to enter Hell will be given different levels of punishment according to the deeds they used to do during their worldly life. The worse one's deeds were in the worldly life the lowest one's level will be in the Hellfire and the harder one's torment will be. 1- People who used to unjustly eat up the property of the orphans. They have flews similar to those of camels, swallowing red-hot stones and then issuing out of their backs. 2- Adulterers offered tasty fatty meat and rotten smelly one but they make option for the latter. The licentious women were also there hanging from their breasts. 3- People whose heads were being shattered, then every time they would return to their original state and be shattered again without delay. He said: "O Jibreel, who are these people?" He replied: "These are the people whose heads were too heavy (on their pillows) to get up and fulfill the prescribed prayers." 4- People who wore loincloths on the fronts and on their backs. They were roaming the way camels and sheep roam about. They were eating thistles and Zaqqoom (the fruit of the tree that grows in hell) and white-hot coals and stones of Fire. He asked: "Who are these, O Jibreel?" He replied: "These are the ones who did not pay Zakaat (obligatory charity) from what they possessed, whereas Allah never kept anything from them." 5- People who had in front of them excellent meat disposed in pots and putrid, foul meat, and they would eat from the foul meat and not touch the good meat. He said: "What is this, O Jibreel?" He replied: "These are the men from your Nation who had an excellent, lawful wife at home and who would go and see a foul woman and spend the night with her (i.e. have illicit relation); and the women who would leave her excellent, lawful husband to go and see a foul man and spend the night with him." 6- A man swimming in a river of blood and he was being struck in his mouth with rocks which he then swallowed. The Prophet (sallallahu alayhi wasalam) asked: "What is this, O Jibreel?" He replied: "This is what happens to those who eat usury." 7- A man who had gathered a stack of wood which he could not carry, yet he was adding more wood to it. He said: "What is this, O Jibreel?" He replied: "This is a man from your Nation who gets people's trusts when he cannot fulfill them, yet he insists on carrying them." 8- People whose tongues and lips were being sliced with knives. Every time they were sliced they would return to their original state to be sliced again without respite. He said: "Who are these, O Jibreel?" He replied: "These are the preachers from among your Nation who used to advise others to do what they themselves don't do…"